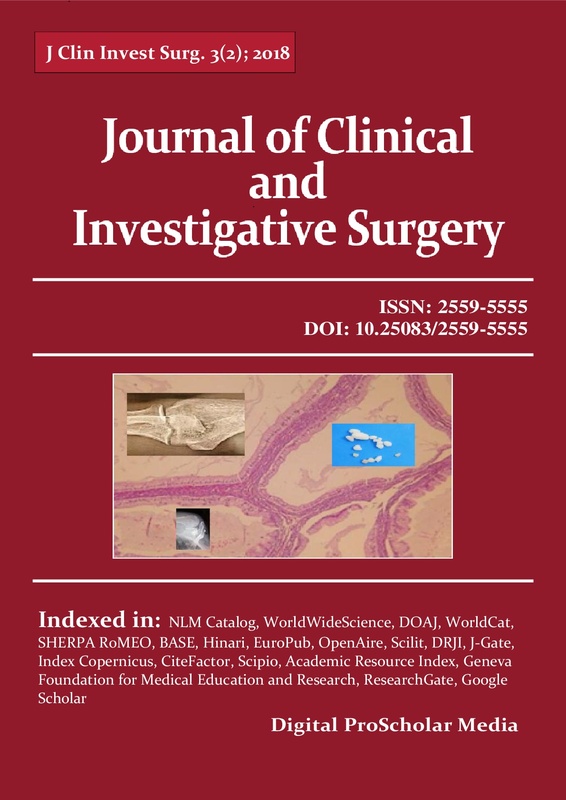 Journal of Clinical and Investigative Surgery is licensed under a Creative Commons Attribution-NonCommercial-NoDerivatives 4.0 International License, which means that the content published in this journal (articles, conferences, book reviews, etc.) can be downloaded/ used only for non-commercial purposes, without to be modified in any way and specifying the original source. All accepted papers are published free, open access, according to CC-BY-NC-ND license. J Clin Invest Surg. has two issues a year, on May and November. It combines submission management, editorial and peer-review tools supplied by Digital ProScholar Media, which also supports the digital archiving policy of the journal. As member of Crossref, Digital ProScholar Media assigns DOI to each article published in Journal of Clinical and Investigative Surgery, and manifests zero tolerance for plagiarism. The full responsibility for the content of articles published in J Clin Invest Surg. belongs to the authors. For this reason, the corresponding author must read and sign a Conflicts of Interest Disclosure Form, stating that the paper is an original work which haven’t been previously published (entirely or in part) and that the author(s) accept the full responsibility for the content of the submitted article. J Clin Invest Surg. allows the author(s) to hold the Copyright of accepted and published articles without restrictions.